Hello everyone and God Bless! I'm new to this forum, but found it while searching some stuff for our church! I'm a novice when it comes to church sound and A/V. I run the sound and A/V for our small church. 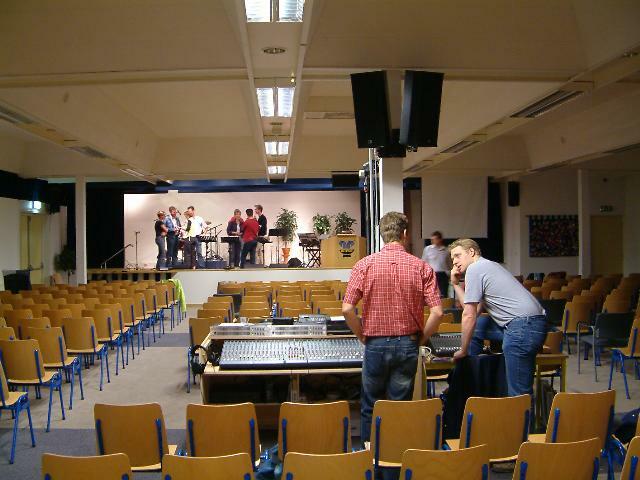 We are in the middle of remodeling our church, physical structure and sound. Our Sanctuary is about 80'long and 40' wide. We have a low ceiling, about 13-15' in the center and about 9' on the sides. The pastor is wanting to replace the current speaker system, the house and the monitor speakers. He would like to install ceiling mounted speakers for the house speakers. The reason being, people have hit their heads on the wall mounted speakers. The pre-exisiting speakers are old Peavey's 15" w/horn PA speakers. Four speakers in all, two house and two monitor speakers. The power source running the set up are two Behringer EuroPower EP2500. What type of "house" speakers would you recommend? We play contemporary music...basically guitars (lead & bass), vocals, and keyboard through the soundboard. Your biggest problem is coverage. It will be hard to cover that room with such a low ceiling. Here is a similar church, you can see what they did. Probably a distributed system with time-delay. For contemporay music with electric bass and drums, some subwoofers would fill out the low end if you use really small speakers in cieling or low profile (under balcony style) speakers. I flew two Renkus Heinz dead center. Perfect coverage and a beautiful sound. You might also look up the TOA HX5 speakers. I'll stay away from the CPL27's (personally) because they have dome tweeters (if I recall correctly) and not compression drivers for the HF. Dome systems are great for distributed background music and light foreground music but are not appropriate for the music style and requirements you defined here. In addition, a dome tweeter (generally) has 90/90 coverage - probably not tight enough pattern control for your application. The C2560's would work nicely either as depicted in the photo Aaron supplied or as a center cluster. I would also consider something along the lines of a Yorkville C2890's (as an example only) delayed down the sides with perhaps (2) subs for low end augmentation. Many manufacturers make speakers suitable for distribution and work well for contempt music - from Yorkville to EAW to Meyer to JBL etc. - your budget will help you make that decison. On your location you will have to work with a delayed cluster(s) and a centrecluster with a coverage of 120-180 in place of the beam-er. Give me more live music. Rene, When you say "Wheatland", do you mean Wheatland, Wyoming? If so, there's plenty of help from Ron Balsom, Highland Park Community Church, Casper,Wyo. home 307-237-7591, cell days, 307-262-2138, ronbalsom@aol.com personal gift is to help other churches in these areas at no charge. If there ever was a place we ought to 'hear' good, it's in church! However, because of budgets and local knowledge, many churches suffer in these areas. I'd be blessed if I could help. It will cost a Pizza!! !